a) List of countries from where the denim fabric is being imported into India either for re-export in the form of garments or for local use . b) The quantity of fabric coming from major exporting countries. c) The value and average prices of fabrics coming from each destination. Though India has a large manufacturing base for denim, denim has started coming into India from various countries around the world. 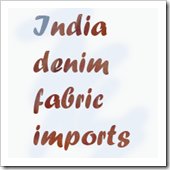 The denim is mainly being imported due nominated orders from final garment customers in the West . But now local brands in India have also started to have a taste of premium denim from other companies around the world and are trying to import the same despite high duties. Some of the countries from where denim is coming from are mentioned below for the period April to Oct 2011 . Also given are average prices , quantities coming from each country.